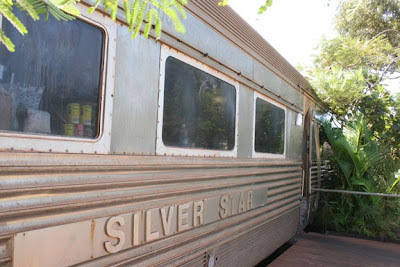 Todays driving was a bit of back tracking back to South Hedland to do some shopping and stock up before heading out into the wilderness again. 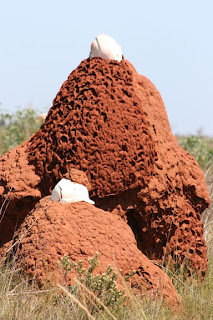 Just outside Port Hedland the local miners have had some fun with the surrounding ant hills. I guess the mines must go through a few miners hats as there are heaps hanging out on the outback ant hills. We decided to stay at a different caravan park this visit - oh I wish we hadn't! It was a bit cheaper, although everything in this part of the country seems to be expensive. It was also obvious that in this part of town that the industry seemed to go 24/7. All night all you could hear was planes, trains and trucks! Thank goodness I bought ear plugs along with me. As well as stocking up on food etc. we went to the Silver Star Cafe for brunch. 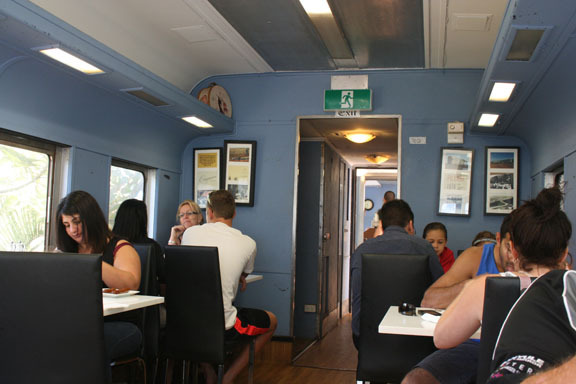 This original 1930's American train carriage started its life visiting the stations of Missouri to the Australian Outback in the 1970's for the Newman Mining Company and is now situated in Port Hedland living out the rest of it's years feeding locals and visitors.